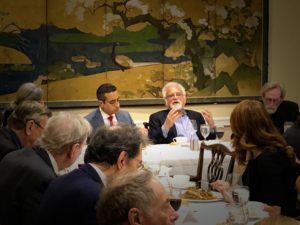 The Reiss Center on Law and Security at New York University School of Law and The Century Foundation held a discussion on Wednesday, December 5, with Barnett Rubin. Drawing on his decades-long friendship with Saudi journalist Jamal Khashoggi, and his longstanding engagement with Saudi Arabia, he discussed the impact of the murder on Saudi stability and the future of U.S.-Saudi relations. The discussion was moderated by Michael Wahid Hanna. Professor Stephen Holmes provided introductory remarks. Barnett Rubin is Associate Director and Senior Fellow at the Center on International Cooperation (CIC), where he directs the Afghanistan Pakistan Regional Program. From April 2009 until October 2013, Rubin was the Senior Adviser to the Special Representative for Afghanistan and Pakistan in the U.S. Department of State. Before joining CIC in 2000, he was Director of the Center for Preventive Action, and Director, Peace and Conflict Studies, at the Council on Foreign Relations in New York. Stephen Holmes is a Faculty Director of the Reiss Center on Law and Security and Walter E. Meyer Professor of Law. Holmes’ research centers on the defense against transnational terrorism within the bounds of liberal constitutionalism, emergency powers, the disappointments of democracy and economic liberalization after communism, and the history of European liberalism. 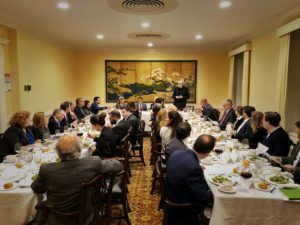 This dinner is part of a series of salon-style discussions hosted by the Reiss Center on Law and Security and The Century Foundation, focusing on pressing national security issues of the day.